In 1997, when the idea of a water station was just a dream, it was Wude who made it a reality. She started the first water station outside her front door with a hose, local kids and family and a lot of very brightly colored buckets. She is a tall, thin and very proud woman who had very little in the way of material things and a lot in the way of conviction and heart. She had no formal education but that didn't stop her from creating an authentic roadside institution of learning that made history in her village. When we first met her she had emaciated cows that she sheltered and fed and refused to kill for food. "I simply loved them": a convincing conviction she would make with her arms around a cow's neck. 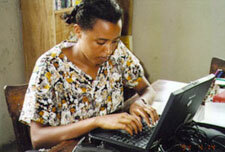 In gratitude for her work, KI helped to rebuild her home. Her water station continues as a business that she operates to support herself. Wude paid for mesay's initial computer lessons from her profits. She is a strong source of referrals to the clinic only a few miles away. We support her efforts with the orphaned children she adopts knowing that they have a strong role model and a head start. She is without question a heroine. 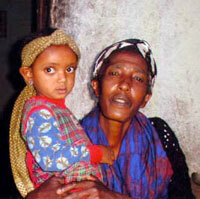 Her mother Wude, a fellow heroine, started the first water station on a busy road in Debrezeit. Mesay was filling water buckets for thirsty horses well before Kindness International eve became a non-profit organization. Because she was always an eager and hard worker, she quickly became proficient in first aid, gentle handling, injection and hydration therapies. When the successes of the water station gave rise to the need for a local clinic, Mesay showed her tremendous business abilities by becoming the internet liaison between the "Kindness Clinic" and the base office in Colorado. Seeing that men dominate the Ethiopian business world, she was taking on a huge responsibility and cultural risk by running the administration of the clinic. When the management of the clinic shifted its focus to academia and veterinary medicine, Mesay insisted on preserving the core principles that our organization had founded the clinic on. We are tremendously indebted to her for her continued devotion, loyalty and determination; qualities that helped change the way an entire city treated its working animals. Oh, and did we mention she was also in charge of the clinic's domestic needs and raising an orphan? A DEFINITE HEROINE. 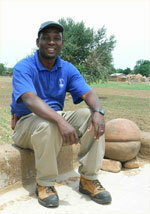 Dr. Anthony Nsoh Akunzule is Kindness International's “Project Coordinator” for Ghana. He is a veterinary surgeon of many skills who consults for the Ministry of Food and Agriculture in Ghana as well as for the Heifer and World Vision projects in his country. He was connected to us through a fellow African Cornell University graduate who we are lucky to have on our board. When Akunz first contacted us in 2000, it was his passion for helping the people of his beloved country and his heartfelt concern for the well being of all animals that caught our attention. He wanted to discuss with us the possibility of funding a project in his home village that would increase agricultural output by replacing manual labor with animal power. His willingness to introduce kindness with this new draught animal power opportunity transformed our interest into action. Four years later, his consistency with incorporating kindness in all of his trainings and programs has lifted him to hero status. 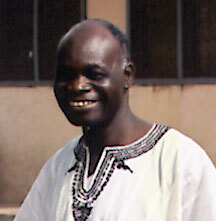 His motivation, dedication and compassion have been instrumental in the development of all of KI’s Ghana programs such as Women’s Poultry, Yoke Improvement Program, and our involvement with a local Orphanage. His professed passion for spreading kindness in Ghana gives credibility to our shared crusade to improve the quality of life for four-leggeds and two-leggeds alike. Dr. Ayamdooh Nsoh Evans came to us through our project in Ghana at the recommendation of Anthony Nsoh Akunzule, a fellow hero. 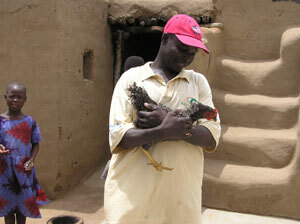 Ayamdoo is a native of Tamale in Ghana and a full time veterinarian there. When New York was bombed on September 11th, it paralyzed the airspace and travel industries for quite some time. The AAEL (the former name for Kindness International) was in the unfortunate predicament of being unable to ship life-saving medicine to our newly opened  Kindness Clinic in Debrezeit, Ethiopia. Although he had never met us, Ayamdoo agreed to be our ambassador of hope by personally delivering these supplies and teaching at that clinic for two full weeks. 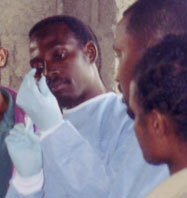 We were excited to send him as the first instructor to visit the new clinic. We were doubly amazed when we learned that he had just had his first child, yet he took on the task of traveling from Ghana to another African country to share his knowledge. The kindness and grace for animals and children that Akonyure has shown since the first time I met him, continues to be the example by which all others in Yua are asked to emulate. He is their teacher for gentle handling. Copyright ©2010 Kindness International, All Rights Reserved.